This is the best subcompact car for you if your modest aim is a brilliantly packaged, fuel-sipping urban runabout. Indeed, Honda has achieved a space-efficiency milestone here. Fit furnishes real room for four adults — or two with a crossover-threatening 53 cubic feet of cargo volume — in a four-door hatchback just 13.5-feet long. Fuel economy rivals hybrids at a fraction of the price. And it’s among the least expensive cars available with autonomous emergency braking, one of today’s most important safety features. While Fit is on target in lots of respects, its sales are decidedly modest, down 9 percent through April 2018. Bad as that looks, it’s less severe than the 20-percent drop suffered by the subcompact-car segment as a whole. All cars, in fact, are suffering as buyers rush to crossovers; cars now account for only about 35 percent of U.S. light-vehicle sales. 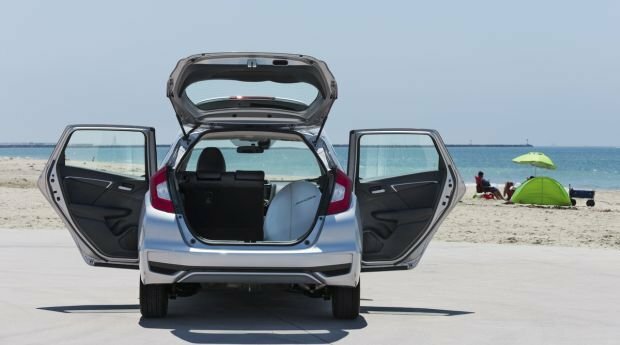 Honda itself heard the call and reconfigured the Fit to create its HR-V, a subcompact crossover that outsells the Fit nearly 2-1. Should you buy a 2019 model or wait for the ’20? Buy a 2019. It benefits from midcycle updates that came on line for model-year 2018 and will see this car through to its next scheduled redesign, likely for model-year 2021. The ’20 won’t change in any way worth waiting for, but it’ll almost certainly cost more. 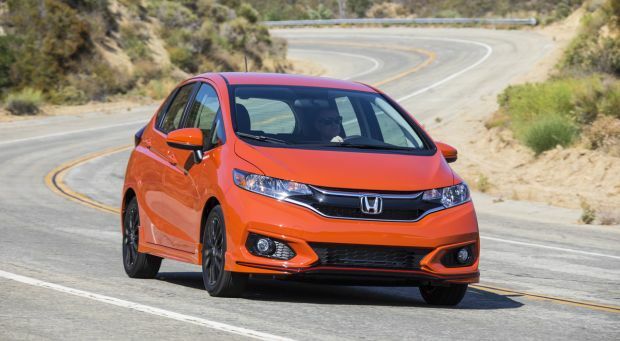 Both the 2019 and ’20 Fit with continue with front-wheel drive, a four-cylinder engine, and a choice of manual transmission or a continuously variable automatic transmission. The ’19 Fit will likely repeat a 2018 lineup consisting of base LX, snazzier-looking Sport, dressier EX, leather-upholstered EX-L, and top-line EX-L with Navigation models. The Sport has some aero body addenda, trendy black wheels, and a chrome exhaust tip; all models save the LX have fog lamps. Wheels provide the only other visual distinctions, with the LX getting 15-inch steel wheels with plastic wheel covers and the other models equipped with 16-inch alloys. The Honda Sensing suite of safety features that includes autonomous emergency braking is available for the LX and Sport and standard on the EX group. Rather than debating which model-year, Fit to buy – and as much as we admire Fit’s virtues — we’re compelled to advise the dwindling number of car shoppers who actually want a small Honda hatchback to walk across the showroom and check out the Civic. A Civic hatchback in base LX trim with Honda Sensing lists for around $22,000. That’s some $2,000 more than the Fit LX with Honda Sensing and, granted, two grand can be a formidable stretch at this strata. But the few extra bucks a month is worth it in the long run. We’ll explain why. Styling: Fit carries over the styling updates that came with the 2018 freshening: new fasciae front and rear, a chrome and piano-black grille, and new wheel finishes. They made this little wagon look slightly more planted and maybe a bit more sophisticated. But they altered neither its urban-friendly narrowness and stubby nose nor its space-enhancing tall roofline and diminutive wheel housings. So Fit still looks like the ultra-rational transportation module it is, and for that, fans of less-is-more motoring can rejoice. The high roof, low floor, and relatively long wheelbase makes it a marvel of practicality. Honda’s “Magic Seat” rear bench flips up to create a useful cargo channel behind the front buckets or folds to open nearly 53 cubic feet of cargo volume. You can even configure the front passenger seat into a nifty sleeping platform. Outward visibility is terrific. The utilitarian ideal extends to the just-good-enough quality of the cabin’s plastics and fabrics. Unimpressive at any price is the level of wind, road, and powertrain noise infiltrating the cabin. Rivals such as the Kia Soul and Nissan Versa Note are quieter, if not quite as space-efficient. If, however, you want true interstate-journey isolation in an affordable alternative, consider Honda’s own Civic hatchback. It feels more solid and refined than the Fit and treats its passengers to nearly as much room. Maximum cargo volume is less, though a still-impressive 46 cubic feet, but there’s 26 cubic feet of carrying space behind the rear seat, to Fit’s 16. Mechanical: Nothing changes. All Fit models again have a 1.5-liter four-cylinder engine rated 130 horsepower and 114 pound-feet of torque with the six-speed manual transmission and 128 horsepower and 113 pound-feet of torque with the continuously variable transmission. A CVT does the work of a conventional automatic transmission but without stepped gear changes. It’s standard on 2018 Fit EX-L and EX-L with navigation models and available at extra cost on the others. Fit’s power ratings are at the high end of its competitive set, but acceleration is not a selling point. You’ll need to use lots of throttle to move with any verve; even then, this car is lazy off the line and labors in any sort of merging or passing situation. Unfortunately, the manual transmission provides hardly any advantage in response over the CVT, and neither quells the coarse engine droning and minor structural vibrations that come with working this engine hard – which you’ll frequently do. Fit’s natural habitat is the central city, where it’s highly maneuverable and easy to park. The suspension’s ability to absorb bumps and provide sharp handling in changes of direction diminishes as speeds increase beyond urban norms. Rivals like the Chevrolet Sonic, Hyundai Accent, and the Soul and Versa Note all feel more at home in a wider variety of driving applications, but again, none matches even the base Civic LX for all-around performance, comfort, handling, and composure. Features: No changes to an equipment roster that compares favorably with any in the class. That Honda Sensing is available on all Fit models – and standard on EX versions – is laudable, although you can’t get it with manual transmission on an LX or Sport. HondaSensing consists of autonomous emergency braking that can automatically stop the Fit to avoid a frontal collision. It also provides adaptive cruise control to maintain a set distance from traffic ahead, as well as autonomous lane-maintaining automatic steering. EX models also come with Honda LaneWatch, which projects onto the central dashboard screen a live video feed of the car’s right-side blind spot when the right turn signal is activated or at the push of a button on the end of the turn-signal stalk. Standard on every 2019 Fit is a rearview camera, automatic on-off headlights, LED brake lights, Bluetooth HandsFreeLink, and a front center storage console with armrest. In addition to its exclusive exterior touches, the Sport builds on the LX with interior trim featuring black cross-hatched fabric and orange accent stitching, a leather-wrapped steering wheel and shift knob, and steering wheel-mounted paddle shifters on CVT models. Sports also pull from EX trims a 7-inch central dashboard touchscreen interface with Apple CarPlay and Android Auto compatibility, plus a 180-watt six-speaker audio system. 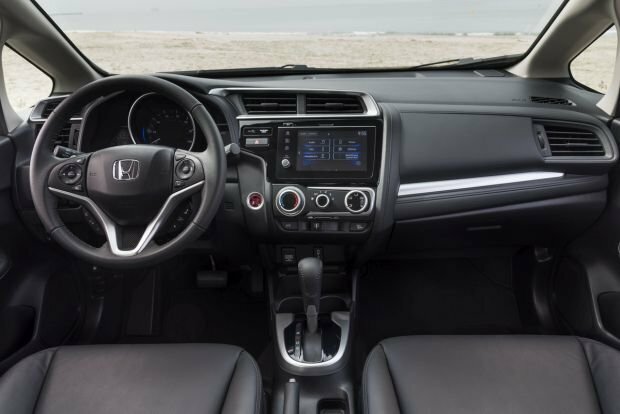 The Fit EX includes Honda Sensing standard with either transmission, plus satellite radio, variable intermittent wipers, keyless entry with pushbutton ignition, a power moonroof, and sliding sunvisors. The EX-L includes all that, plus leather upholstery, heated front seats and heated side mirrors with integrated turn signals; the EX-L with Navi model adds imbedded navigation that, unlike mobile phone-based apps, guarantees real-time navigation even in the absence of a cell signal. 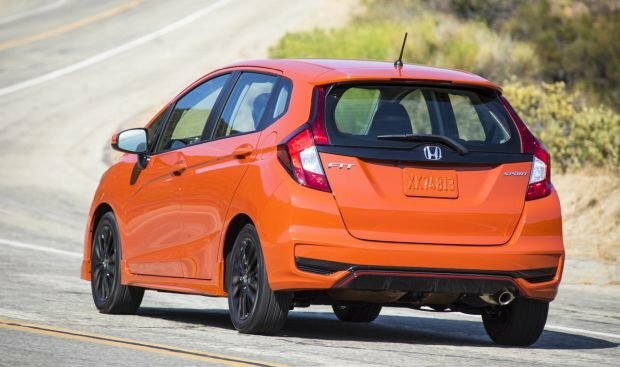 Hewing to Honda practice, the Fit offers no stand-alone options; the automaker establishes a set of features for each trim level and prices those with extra features, such as HondaSensing or leather, as separate models. Thus, 2018 Fit prices a seem slightly higher than those of direct competitors, though bottom-line stickers are very similar to those of like-equipped rivals. Fit prices include Honda’s $890 destination fee. The 2019 Fit LX is priced at $17,080 with manual transmission, at $17,880 with the CVT, and at $18,880 with the CVT and HondaSensing. The Sport is priced at $18,390 with manual transmission, at $19,190 with the CVT, and at $20,190 with the CVT and HondaSensing. Honda prices the ’19 Fit EX at $19,050 with manual transmission and at $19,850 with the CVT. The EX-L and EX-L with Navi come with the CVT and are priced at $21,410 and $22,410, respectively. EPA ratings are exemplary, with the ’19 Fit LX equipped with the CVT one of the few non-hybrid cars rated at 40 mpg in highway driving. With manual transmission, Fits rate 29/36/31 mpg city/highway/combined. With the CVT, the LX rates 33/40/36. Equipped with the CVT, the Sport and all EX models rate 31/36/33 mpg.